First, please tell me a bit about yourself, ie. Where you live, any schooling, how long you’ve been making art, your favorite medium(s), favorite artists/influences, and (most importantly) where do you sell your art online? When I was a kid, I wanted to grow up to be either a veterinarian or an artist. Nowadays, I’m an illustrator/designer with an affinity for painting animals. Sometimes things just work out like that. I studied illustration and graphic design in college and worked for a design firm specializing in branding when I graduated. 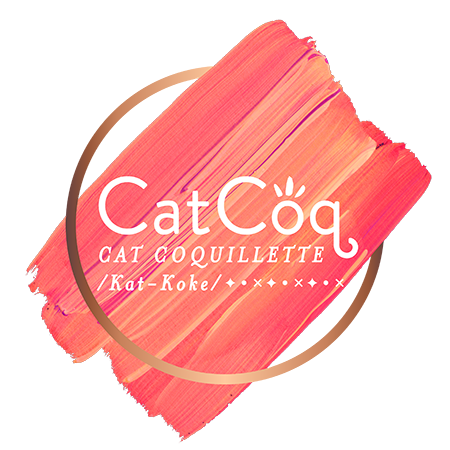 I’ve since begun my own business, CatCoq, and am full-speed ahead managing my brand. Illustration was my first love, and it’s currently the backbone of my brand. My style is bright, colorful, and typically incorporates intricate details and hand-lettering. I sell art prints and cards through my Etsy shop and have a wide variety of products available on my Society6 and Redbubble stores. I also have a variety of phone cases available on Casetify. I really loved looking through your Society6, when did you decide to take your art – as a business – seriously? What habits do you strongly believe contribute to your success? When I worked a nine-to-five, I got into a habit of coming home from work & diving into a painting. It was the perfect way to relax after a full day of staring at a computer screen. I’ve been painting for as long as I can remember, so this wasn’t anything new. One day, I was scrolling through artwork on Society6 when I realized, “My work could be up there.” It sounds so small, but this was a huge leap for me. Before this, all my creative output was divided into two categories: client work and personal work. Selling artwork online was a sort of bridge between the two. I was no longer painting just for myself, but for others as well. I started posting my paintings on Instagram and in the matter of a couple years, went from having about 300 followers to nearly 10,000. Opportunities began to bloom from there– people began reaching out for custom illustration or design work, I began selling through a larger variety of platforms, and I opened up my own online store. Pretty soon, it just made sense to make the leap and pursue this full time. It was terrifying to leave behind a job that I’d loved (especially with all it’s securities like a steady paycheck and benefits) and take a gamble on myself, but it ended up paying off. I’m now pursuing what I absolutely love, earning a viable income, and am making all my own calls. I’ve struck a balance between the creative and business side of my brand. For every hour that I spend painting, I typically spend another marketing, promoting, corresponding with clients, or doing any number of tasks like mailing out the week’s Etsy orders or filling out my income/expense spreadsheet. Name recognition is one of the most important assets of succeeding as a commercial artist. Because my background is in branding, I had a head start with this side of the business. I tossed out my student website and started from scratch to build a website tailored to my CatCoq brand. I then took a hard look at my social media and decided to ditch the selfies and pictures of my pets in favor of a more professional look. My blog followed– I write about my latest art shows, mentions and collaborations with other brands, latest work, and fun personal stories like my experiment with a Polaroid or my first stab at SFX makeup for Halloween. I polished up my collateral materials as well– I designed a logo that hinted at my illustration style, ordered business cards, whipped up templates for invoices and proposals, and established a style guide for social media and my portfolio. All these added up to a stronger brand with more impactful name recognition. Once you strike the balance between being excited about what you’re doing & making a living, you’re on the right track. How long have you been selling on Society6/RedBubble/etc.? Was that the first place you starting selling your work online? And have you tried other platforms? Society6 was the first platform where I began selling my work. I uploaded my first piece in June of 2014: a venus flytrap watercolor painting. I made some extra spending money through sales, but things didn’t begin to really take off until a few months later. When my monthly sales amounted to my rent, I was ecstatic. When things increased, I realized this could be my base for making a living as a freelancer. I’ve since opened up shops with Redbubble, Casetify, Etsy, Drawdeck, and Storenvy. I also have collections available through Modcloth, Art Crate, iCanvas, and Evermade. How often do you add new designs to your shop? Do you find certain products (ie., prints, cell phone cases, clothes, accessories, etc.) sell better than others on a consistent basis? If you sell on multiple platforms, do you have a system for keeping track of what sells and where? Art prints and phone cases are my most profitable sellers, although my daily sales includes just about every product imaginable: apparel, tapestries, rugs, cards, pillows, tote bags, clocks, duvet covers, mugs, blankets, you name it. Do you have a social media strategy for driving traffic to your shop? I’m constantly experimenting with new ways to enhance my social media and grow my audience. I’ve done giveaways, sent out samples of my work to social media influencers, posted works-in-progress, behind the scenes, and asked my audience what they’d like to see me do next. This mix of content has helped to grow my brand on social media. I include a link to my shop about 50% of the time. Any more than that would come across as too in-your-face sales-focused. Is there anything you find particularly challenging or frustrating about selling on Society6 ? Society6 can be challenging for new artists hoping to get noticed. My best advice is to be persistent. If your work is good, people will eventually begin to take note. It’s a little overwhelming to join the hundreds of thousands of artists within the Society6 community and hope to make a profit, but talented work always rises to the top. It helps to be active within the community– follow other artists, like and comment on their work, and share your shop URL across your social media. I would caution artists against putting all your resources into just one possible outlet. I diversify and sell my artwork through a variety of print-on-demand websites as well as my Etsy shop. I also have active licensing agreements ongoing with a number of companies at any given time. Because of this, my income derives from a variety of channels. One bad month on Society6 isn’t ideal, but it’s not going to kill me.